I had not planned on hitting the Himalayas alone and so I was not completely sure what was ahead. However, that night I did some homework, checked my route and by the morning, with my GPS now working again, I was back on the road and once more singing in my helmet with all my optimism and excitement well and truly restored! Back in control of my own destiny. I was confident that being alone was going to give me the best experience and so, with Janis Joplin keeping me company, I left Srinager and headed further in to the beautiful green Kashmir, onwards and upwards to Kargil. The people here are so friendly, I stopped several times for a drink or for some ice cream, had lots of photos taken by welcoming strangers and lost count of the amount of times I explained to concerned passers by that my headlights are automatic and are always on when the engine is running(I have been doing this ever since I left europe)! It was not a problem. It seems the majority of people speak english in this part of India and so I made the most of the company I found myself in. As I started climbing in to the mountains I saw more and more Indian bikers coming in the opposite direction, most of them carrying the prayer flags across their bars. If I stopped then they generally stopped and shook my hand, impressed by my bike and by my journey. They wished me luck on my trip up in to Ladakh and assured me that with this bike, I would have no problem. The route would be easy. I was reassured, although I did not feel nervous, just excited. 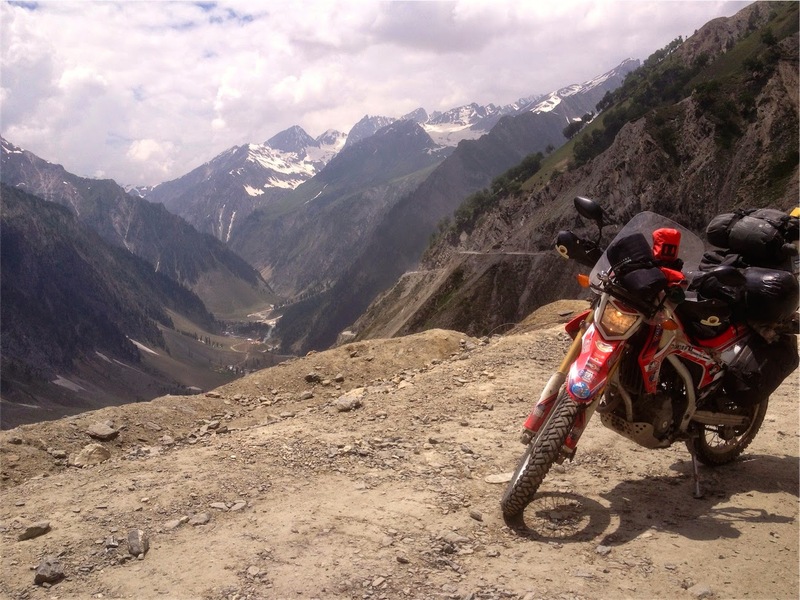 I felt surrounded by wonderful mountains and friendly people and although the mountain tracks were going to be challenging, I knew that if I had a problem, it would not be long before a biker came along. These places often feel extremely isolated, particularly on your own, but where there is an adventure to be had, there is often a biker to be found! As I climbed, the traffic stopped and the tarmac ran out. Soon I found myself surrounded by snow capped peaks and glaciers, riding higher and higher on narrower and bumpier tracks. I did the thing we all do at this stage and checked my GPS, wondering if I was really on the right road! Reassured, I pushed on, passing a few guys with machine guns, some horses and surprisingly a little guy sitting on a rock, selling nuts and water. This told me that despite it’s appearance, this road was well travelled as suspected. Certainly enough to make it worth his while to be sat there and so if I got in to trouble it may take a while but I would not be here all night. The pass went on for some time and eventually carried me up to 11,500 feet with the track getting extremely narrow at times. Rhonda was showing no signs of altitude problems. I was amazed at how she kept her power, although it was a slow road and I only asked a steady pace of her. I may have changed down a gear more than I would have done normally, but she handled those bumpy mountain passes, laden with luggage with ease. I was mightily impressed and extremely grateful! We had made it all the way from Mumbai, nearly 2,000 miles across india in crazy temperatures and chaotic traffic, to the start of the famous Ladakh AKA Bikers Paradise! I smiled and patted Rhonda on the tank in gratitude. Many people here put their faith in God, I put my faith in a pair of Sidi boots and a Honda called Rhonda! Arriving in Kargil, I was happy but slightly weary and I was growing more and more conscious of a headache. It could have been the bumpy tracks but it was also worth considering the fact that it might be the altitude. I had to be careful and listen to my body. If it became intense or I felt sickness as well then I would have to seek medical attention or get down to a lower level. I knew there was a risk as I had climbed to 11,500 feet very quickly and although I was now at 8,500 feet I was still at risk. I found a cyber cafe and posted a quick message to let people know I was OK as I had no phone and once again my Spot Tracker was letting me down. I then found a hotel and lay on the bed. My headache by now was intense and when I tried to get up I found it extremely difficult. I felt like something was pressing down on me. I also by now felt a little queazy. I knew that water was good for altitude sickness and so I drank lots but after a couple of hours of resting and drinking, I found it was only getting worse and so I went to see the hotel owner who agreed it looked like altitude sickness and sent for some tablets. As directed by the chemist I took one, drank more water and went to bed, taking the next one in the morning. By then all my symptoms had gone and I was extremely relieved. The hotel owner came to see me to check on my progress and I spent the morning in bed to be on the safe side, before heading out for a leisurely stroll in to town. 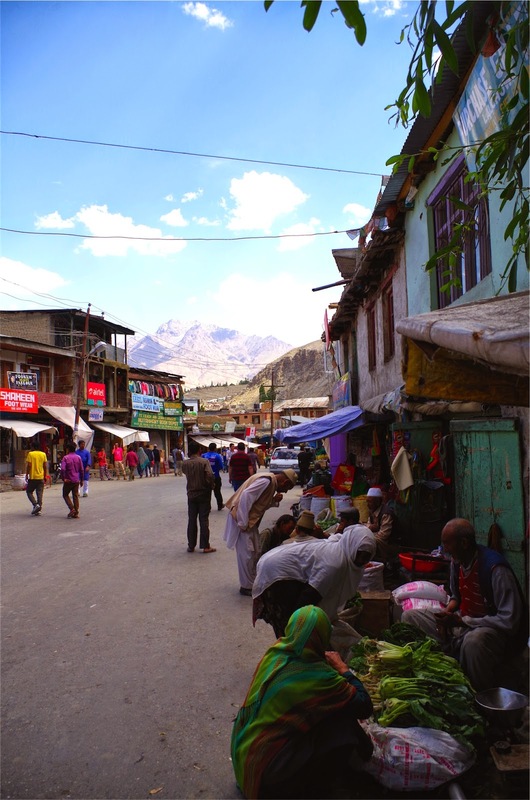 Kargil is a great little place. A relaxed muslim community and famous for it’s apricots. The entrance to my hotel was through a timber yard where everyone said hello to me and smiled warmly every time I walked through. I felt Rhonda was safe with them watching over her. The street we were on ran parallel with the Suru river which runs to Pakistan and it was the place where all the chicken men sold there chickens. Coops of live chickens and people ordering them as fresh as they could be. It seemed that every time I passed, another was being strangled while the rest huddled in the corner, hoping not to be picked and plucked next. The faces are changing again in this busy little town, with its simple shops and market stalls. There is a cross over here between Indian and what looks to me like Tibetan faces. It was a lovely experience to potter around and no one seemed to bat and eyelid at my presence despite me standing out a mile. Clearly they see many travellers through here and welcome each one. They are a happy bunch! 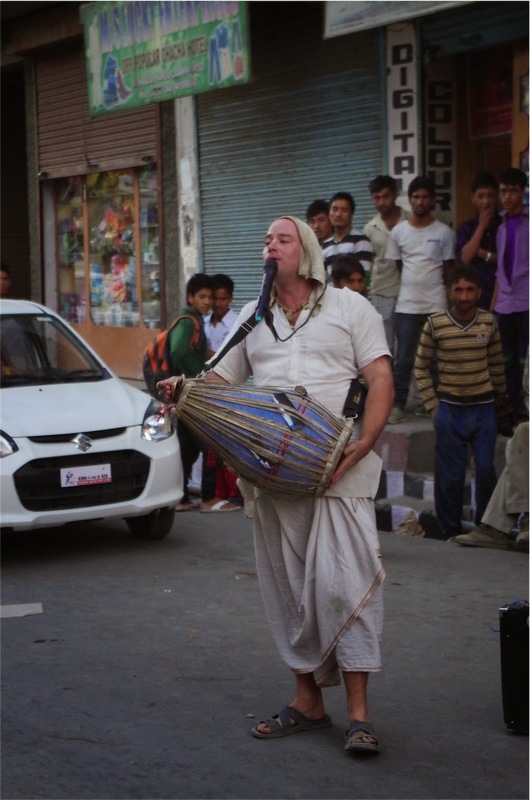 Whilst taking an evening stroll through the busy main street a racket started up and eventually I made out the sound of a guy singing Harry Krishna in to a mic whilst banging a drum. Every one was staring in disbelief. Who was this guy? I got over there to check it out and he looked european. Why would he be singing Harry Krishna in the middle of a Muslim community? The crowds gathered and eventually someone went over to him and pointed out it was not a good thing to do as these were Muslims not Hundu’s. I was surprised to find the response came back in BRITISH accent!! “I am not a Hundu and neither was Harry Krishna”. I did not hear the rest of the conversation as the crowds moved in very quickly and he was surrounded. It felt a little uncomfortable for a minute but no one was making any violent moves, they just crowded him until he had no choice but to get in his car and move on! Why do some people have to be so provoking? I was glad I rested up and spent some time here. What lovely people. I felt so relaxed and could have pottered around for days! 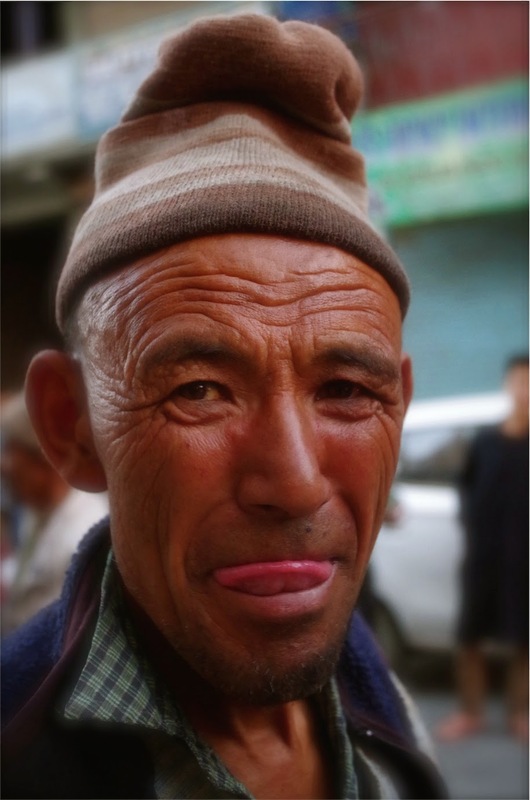 Next I climb higher to Leh and arrive just as the Dalai Llama leaves town! Wonderful reading as usual Steph. You and Rhonda make a great team! Good luck and keep safe. Interesting read. Have a great ride! In case you plan to go to Hardwar, Rishikesh from Delhi you will be passing Meerut on National Highway 58. In which case you are welcome to our home for a break. Me & my son love biking on Royal Enfield 500.
great to hear that you are doing well and so is Rhonda.